Easter is one of the biggest opportunities of the year for your church to share Christ with your community. 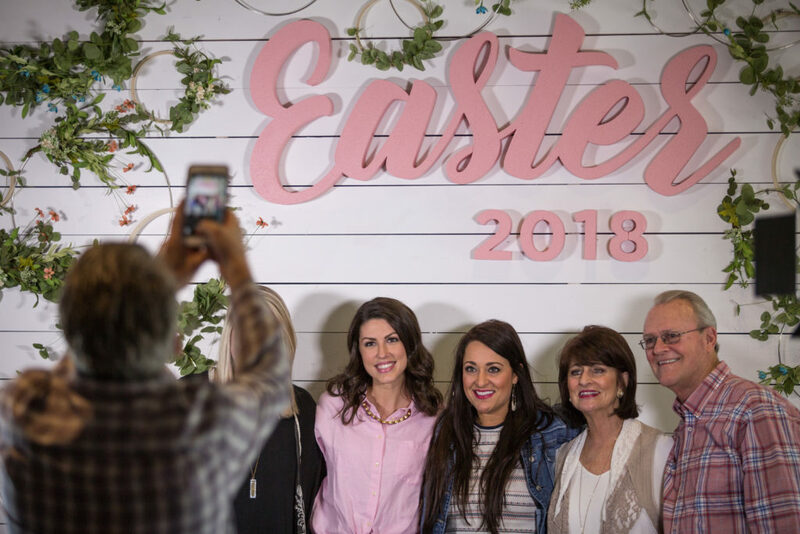 In addition to the Easter message, worship, and prayers, having a photo-op area is one extra touch that can provide value and community to attenders. When you invite people to take a picture in your church, you’re inviting them to make a memory, and for some families it’s the only family portrait they’ll take all year. 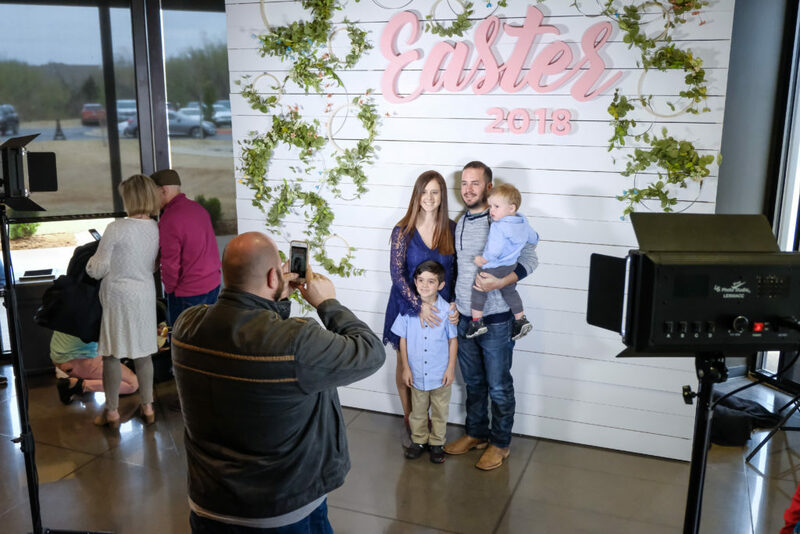 Plus, it’s a powerful inviting tool that gives potential guests a glimpse at what to expect—attenders love to share pictures they’ve taken in your church on Easter with friends, coworkers, and family online. 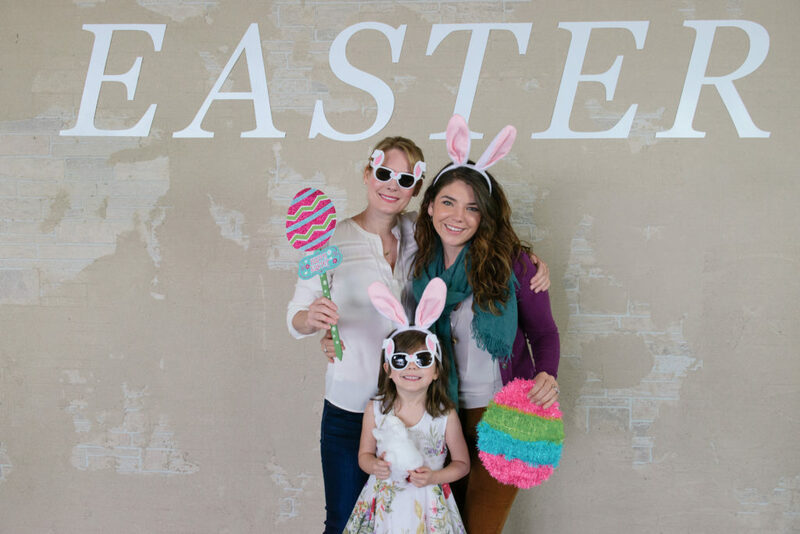 As you implement a photo area this Easter, think through these four key areas: theme, placement, props, and photographer. Read the content below or download our free Easter Photo Op PDF. 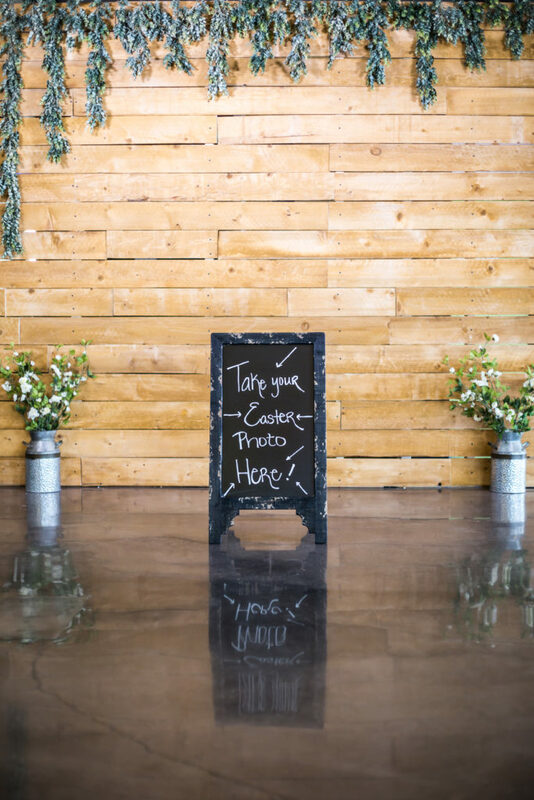 From florals and pastels to strong and rustic, no matter the direction you choose, the theme of your photo-op area should match the overall vibe of your sermon or style of your church. Designing a backdrop that matches the theme and sets the scene for quality pictures takes some prepping. First, see if your backdrop can play multiple roles. 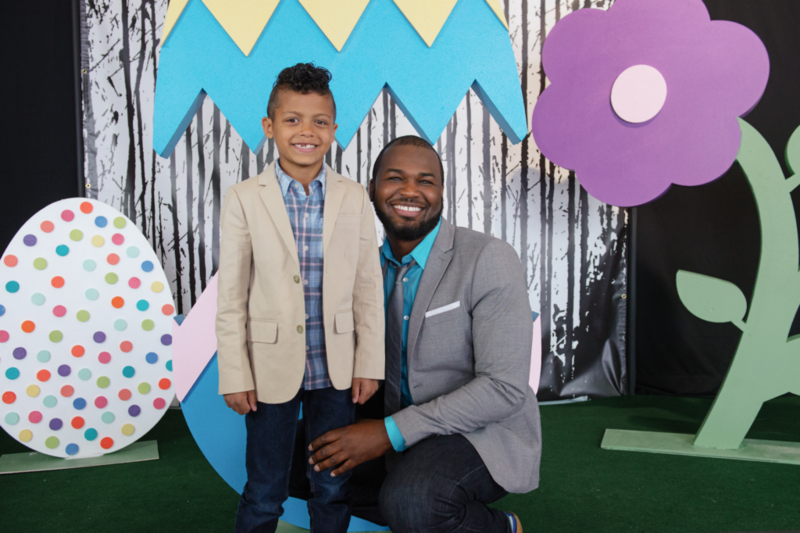 Can you design one basic backdrop that can be tweaked for different themes and events, like Easter, Mother’s Day, Father’s Day, Christmas, or men’s and women’s conferences? A photo op in your kids ministry area should look different than one in your main lobby. Secondly, with your Easter plan in place, leverage volunteers to execute this special project. Not only will you tap into other creative ideas, you’ll help attenders find a way to use their gifts to serve the church. Remember, people take a photo to capture how they feel in a place, and when they share it on social media the photo relays that feeling to a new audience. One final thought: don’t forget safety. Yes, visually your backdrop should look amazing, but with family and friends gathering to snap some pictures, make sure the setup is secure and free of any tripping hazards. Since Easter will bring more visitors than usual to your church, your lobby might be crowded—in a good way! Find a place for your photo area with plenty of visibility, but don’t block commonly-used areas for greeting guests, lines for snacks and check-ins, or walking paths. Dedicate an area that’s easily accessible and provides enough space for a large group photo. Don’t forget about lighting! Make sure your photo area is in a well lit location, has natural lighting, and isn’t backlit, or you can invest in professional lighting kits. Props add more fun and engagement in the photo-op area. Think simple, and explore a variety of options. Some Easter props we’ve used in the past are balloons, bunny ears, sunglasses, fun signs with catchy sayings, feather boas, and hats. 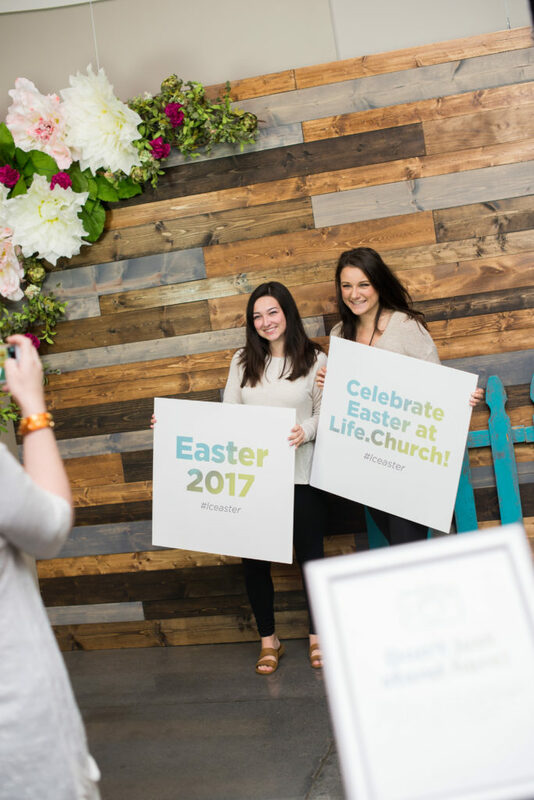 If your photo-op area is ready before Easter, print signs inviting people to attend Easter services as a prop. (This strategy works well for inviting people to baptisms, too.) Ours say things like “Join me at Life.Church” or “Come to church with me.” Signs can say other things, too, that will create the feeling of fun and memory-making for your attenders: “Happy Easter!” or “He Is Risen” and “Indeed!” are fun options. Let your attenders do it themselves. Anyone with a smartphone can be a photographer; just provide the backdrop. To ensure the do-it-yourself photo op runs smoothly, consider printing “stand here” stickers and place them on the floor to show the ideal location to stand for the photo. Create a volunteer photographer position. Ask a staff member or volunteer to serve as the photographer at the photo op area. This person doesn’t have to have photography experience; they should know how to use the flash and frame a photo, but the main thing to look for is someone who can connect with people and make them feel comfortable. On busy Easter or Christmas weekends, ‘lobby photographer’ becomes a volunteer hosting/greeting position. Use a professional. If you’d prefer, you can offer professional photos—even offering them for free as a way to show your attenders some love. If you offer photos taken on a camera versus smartphone, know how you’ll get the photos back to the guests and be clear about how they’ll be delivered: via social media, email, Dropbox, etc. Want more tips for taking photos this Easter? Watch our free Worship Photography training and Lobby Photography training, or join Life.Church staff photographer Robby Doland Tuesday, April 16 on our Instagram Stories for #takeovertuesday.